Founded in 1992, Facility Engineering Associates (FEA) is an engineering and facility management consulting firm delivering quality services to our clients. Our mission is to provide our clients with tools to help extend the service life of existing facilities and building systems. 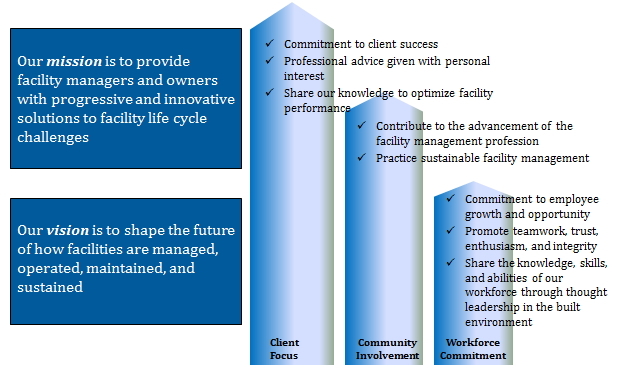 FEA’s client-centered culture thrives on communicating effectively with our clients and in making them a priority. FEA’s growth continues, but always within guidelines necessary for our senior personnel to maintain personal contact with our clients and routine project-level involvement. Our track record of repeat business with large and diverse clients is an indication of our commitment to high technical quality and responsiveness to client needs. Our dedicated staff is knowledgeable of the latest trends, understands major industry issues, and develops individual recommendations based on your environment. Our corporate office is located near Washington, DC, with additional offices located in Denver, CO, Chicago, IL, and Santa Rosa, CA. Additional support from satellite offices can be found in Austin, TX, and Richmond, VA. These locations allow us to provide our services to a national client base on a regional or local level. 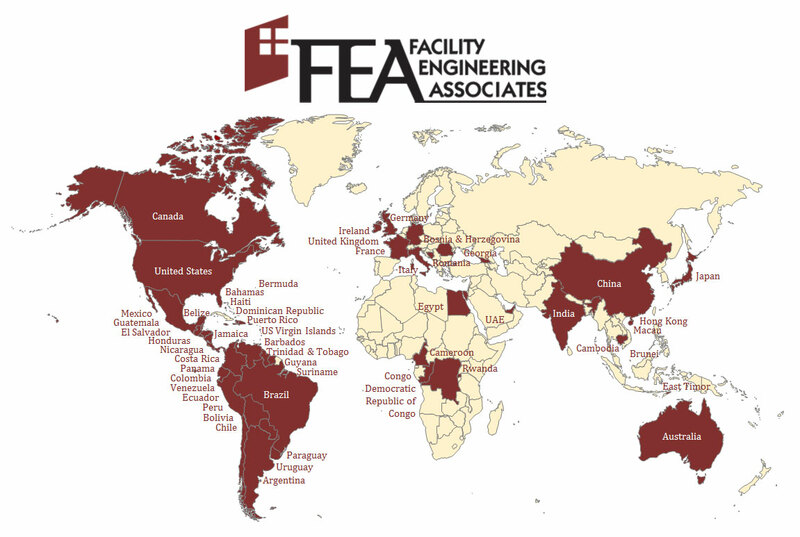 FEA has also traveled around the globe providing engineering and facility management consulting services in numerous countries. The map reflects the 50 states, 49 countries, and 6 territories where we have worked or taught. At FEA, we practice sustainability every day. With an emphasis on operational and organizational excellence in the built environment, we have helped dozens of clients deal with the challenges of sustainability in millions of square feet of facilities nationwide. Not only do we help our clients reach their sustainable facility goals, we practice sustainable facility management in our own facilities. As an ENERGY STAR partner, our mission is to provide our clients with tools to help implement energy management and sustainable practices that extend the service life of existing facilities and building systems. Regardless of the assignment, FEA always looks for opportunities to improve operational performance and save resources. FEA has committed to operating as a sustainable company by reducing our carbon footprint, managing our resources more effectively, and providing services to our clients that allow them to operate their facilities more efficiently, utilizing fewer natural resources, while maximizing the health, safety and productivity of their workplaces. We have a sustainability policy in place and have appointed a Corporate Sustainability Officer that reports to the Board of Directors. FEA’s sustainability goals include actively working towards energy and water consumption reduction, carbon footprint reduction, sustainable purchasing, and waste reduction. We also strive to implement programs and incentives to promote an environment of sustainability in our workplace and promote environmentally friendly and sustainable practices in all of our services. 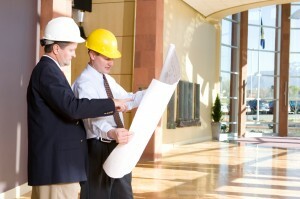 The mission of FEA is to provide facility managers and owners with progressive and innovative solutions to engineering and facility lifecycle challenges; thus, it is critical that FEA maintain a robust and effective Business Continuity Management System (“BCMS”) -to ensure the stability of operations and services for our partners, our community, our nation and our clients around the world. Being clear on FEA’s key products and services, the activities that deliver them, and the priorities and resources for resuming activities. Having tried and trusted arrangements in place to resume activities following a disruption, and routinely reviewing and updating them. The Business Continuity Lead to ensure situational awareness for FEA’s locations in Virginia, Colorado and California. To successfully execute FEA’s Business Continuity Management Policy, every staff member must be safe, informed, and prepared to implement the BCMS.